The wedding of Vladimir Putin’s press secretary Dmitry Peskov and Olympic champion figure skater Tatyana Navka took place on Aug. 1 in Sochi. However, the attention of Russian internet users was focused less on the ceremony itself and more on an expensive watch on the official’s wrist, the value of which is estimated at approximately $620,000. The luxurious wedding of presidential press secretary Dmitry Peskov and Olympic champion figure skater Tatyana Navka on Aug. 1 surprised the public with the pomp and scale of the event. However, the ceremony itself was soon eclipsed online by a torrent of debate over the luxury watch sported by Peskov, visible in one of the photographs from the wedding. One of the first to notice the fashion accessory was opposition figurehead and anti-corruption activist Alexei Navalny, who reported that the price of the Richard Mille RM 52-01 watch, released in a limited edition of just 30 pieces, is 37 million rubles ($620,000). Navalny pointed out that Peskov’s income in 2014, according to his official declaration, was 9,184,358 rubles ($146,300). “Where could the head of state’s press secretary get a watch worth four times his annual income?” asked Navalny. 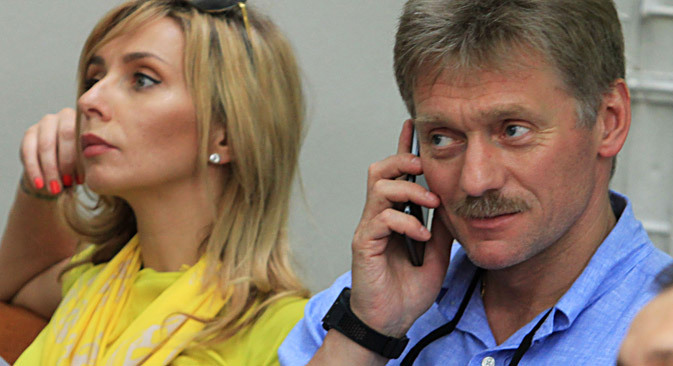 Soon afterward Peskov responded by saying that the watch was a gift from Navka, admitting that the timepiece was "really expensive", but claiming it was "significantly cheaper than some comrades indicate." Soon the hashtag #часыпескова (#peskovwatch) was spreading like wildfire across the Russian internet, and Peskov’s watch was even assigned its own Twitter page. Усы Пескова дороже чем часы Пескова. Запомните этот твит. Количество предложений переименовать аккаунт в Часы Пескова превысило стоимость самих часов.